Function Operation: “UP”: Volume will be increased pressing this button “MENU”: Screen will be become brighter to press this button “DN”: Volume will be reduced pressing this button & to shift between the city mode and high way mode, it will change language to Russia or English if press this button over 5 times. 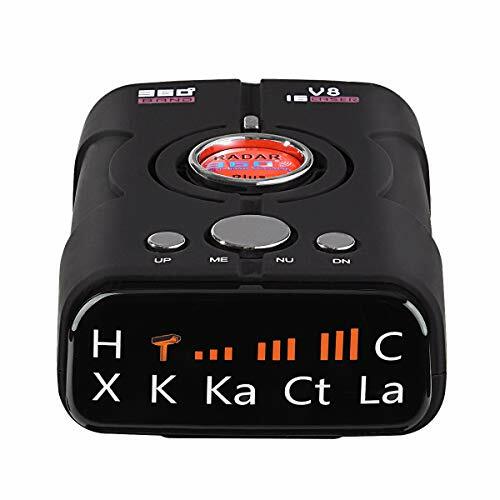 ☛ UNMATCHED DETECTION – JDDZ radar detector’s front and rear antennas scan rapidly in all directions harnessing the lightening-fast focus of Digital Signal Processing (DSP) to find threats faster and more accurately than any other detector. This radar detector can detect any stable or mobile Radio Speed Monitor 250-2500m ahead. Advanced AutoScan processing and digital signal with VOICE announcements help you to control the speed to ensure safely driving. ☛ CITY/ HIGHWAY MODES OPTION. The user can select the operating model in city or highway models which can reduce the false frequency in densely populated urban areas. Extreme range super heterodyne technology and super-fast sweep circuitry help you to extra the range and the accuracy of detection. ☛ 360 DEGREES of COVERAGE. The speed radar detector uses the latest 360 degree radar detection technology and detects from Front, Sides and Rear. The Super-High sensitivity platform provides advance voice warning of K-Band, X-Band, Ka-Band speed traps across all US frequencies. ☛ LED DIGITAL DISPLAY & VOICE ALERT. All radar detectors come equipped with either a icon color display with numeric signal strength display. Digital voice announcements help you to keep your eyes on the road. ☛ WHAT YOU GET. 1 x Radar Detector, 1 x Power Cord (DC12V), 1 x Anti Slip Mat and the package box with user guide. 12-MONTH WARRANTY AND LIFE TIME FRIENDLY & EASY TO REACH CUSTOMER SERVICE.